Mazda 6 s is not for the majority of drivers. It is made to be driven by people who love driving. If you do not like to drive, this is not your car - There are plenty of boring movable sofas out there. The 6s is a wonderful four door drivers car. 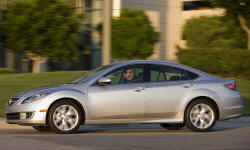 Why the 2009 Mazda Mazda6? Absolute drivers car. The V-6 is powerful, the suspension and frame support the car with a stiffness that is just about the best, in any car that I have driven in this four door sedan class. Comfortable enough to fit three people over six foot AND their luggage - with room left over. This car is very understated and overlooked. If you don't like driving or think a car is no more than an over sized shoe box with seats - look elsewhere. Everything from the turn signals to the headlights are fully adjustable on the Mazda 6. The whole setup is logically arrayed so the driver has everything at their fingertips. Your eyes and hands never leave the road or steering wheel. No groping for controls. Great driving position. Seats are firm and hold you in place. The visibility is great, even out the back. I can drive and drive this car. Much better than the last cars I have owned. Great! The transmission is silky smooth - it's hard to tell when the six speed shifts! Engine pulls strongly; 0-60 mph under 6 seconds with lots of power from the bored out Lincoln V-6 272hp engine. The coolest thing is how the transmission holds the shift so you can accelerate fast out of a curve. This four door drives like a sports car. The slogan should be Zip Zip instead of zoom zoom. I haven't had this much fun in years carving curves and pulling hard out of them. Car even drifts beautifully! The other big plus is space. I am 6'4" with two sons over six foot tall. Even with me driving, there is enough space behind the drivers seat, and plenty of headroom. For the first time people actually tell me the back seats are comfortable! Why Not the 2009 Mazda Mazda6? Car is NOT fall asleep quiet. It drives and acts more like a sports car than fast living room couch. Too many small rattles and little problems. Granted this was the first year model run, but the quality control needs to be upgraded. Dealer and manufacturer support has been the best! The Mazda 6s is like buying a never ending customizable toy. Everything is made to be driver adjustable. From the turn signals to the Bluetooth. After a while it just gets to the point that all you want to do is drive and forget all the little adjustments.... Reminds me of an iPhone. Very understated to the point that it doesn't stand out. The swooping front fenders are the only real distinguishing exterior parts.